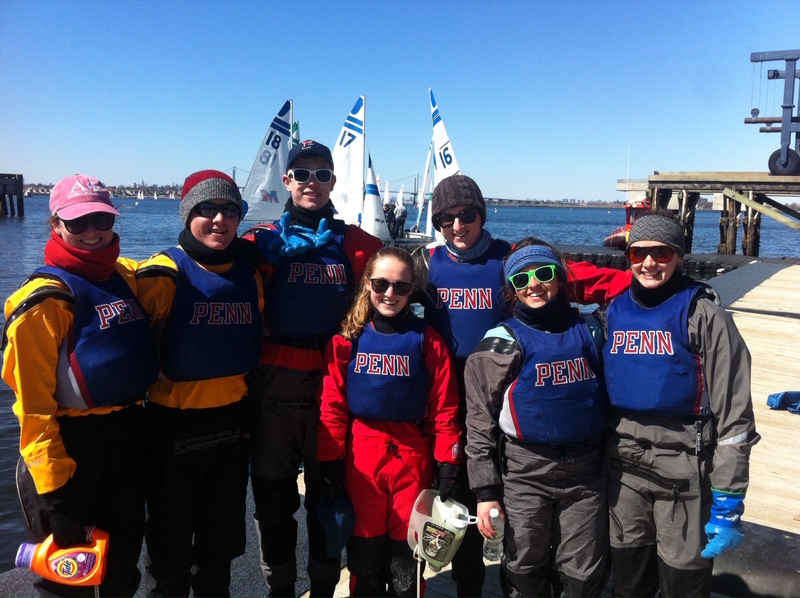 This past weekend, Penn Sailing participated in the Admiral Moore Team Race at NY Maritime. Catie Hopkins, Nina Kaledin, Carolyn Kearney, Jack Swikart, Keen Butcher, Drew Gallagher, and I drove to New York for our second team-racing event of the season. Despite what some would call frigid conditions (snow and sub-35 degree temperatures), the team showed great improvement and aptitude throughout the weekend. Saturday morning began a little slowly. The team ventured to Village Square Bagels in Larchmont to find out that this renowned bagel shop did not in fact serve square bagels. Though slightly disappointed by this discovery, we headed towards SUNY Maritime, eager to start competing. We had the first flight off, which gave us time to dress adequately for the snowy weather. We began racing around 1000 and were out in the water until 1800. The wind blew at approximately 10-20kt from a northerly direction throughout the day. Jack, Keen, and Drew skippered all day, and as crews, Catie, Nina, Carolyn, and myself rotated between boats so we could try to stay a little bit warm. Saturday proved to be a very successful day for the team. By effectively implementing three-boat weaves and thanks to the team’s great enthusiasm and talent, we won three races in the first round robin. -To our Coach Billy Martin for saving us from hypothermia by letting us borrow his gloves, hats, and neck warmers, among others. -To the Gallagher family for their hospitality, and to Mrs. Gallagher for her delicious chili. There are times when a team shows up perfectly prepared for an event, and everything goes according to plan. 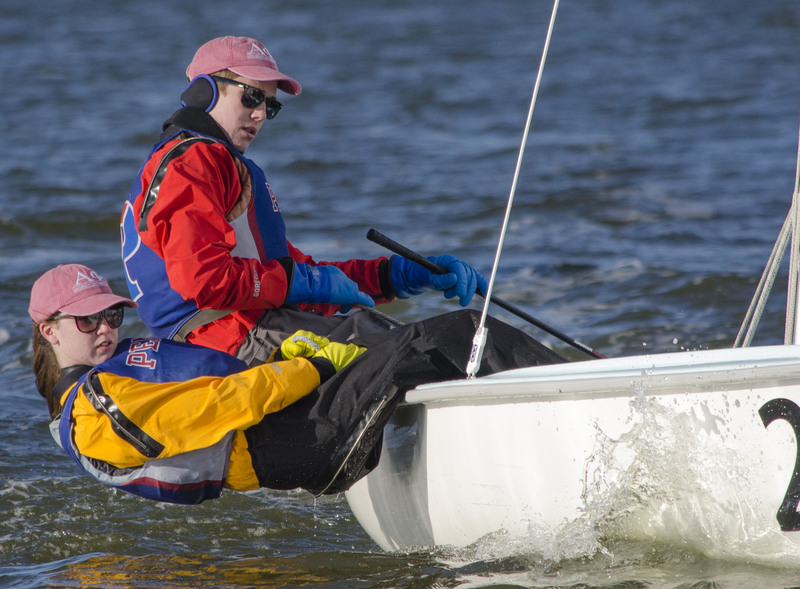 This weekend for the Penn Sailing Team was NOT one of those times. However, that doesn’t mean we didn’t learn a lot and make it as positive an experience as possible. At the same time, last place doesn’t really give our spin-doctor headline writers a whole lot to work with. For the start of the 2015 team race season, Jack Swikart, Drew Gallagher, Joe Egan, Cary Kane, Lucy Sergeant, and Caroline Garth all drove down to Annapolis for the Graham Hall Team Race, thought by many to be as tough as Team Race Nationals or tougher. The problem was, this group had only one day of practice as a team going into the event, and despite a decent amount of team race experience between them, had never team raced together before. Needless to say, this was a recipe for pain. The Quakers did manage to knock off an extremely impressive Fordham team to get one win on the board over the course of two days, but despite many close and hard-fought races were unable to secure another. That’s not to say the team did not know what they were doing, but could be likened to some of Penn Basketball’s performances on the court this year – the right people often in the wrong place at the wrong time. Actually, scratch that. Even we weren’t THAT bad. All kidding aside, the Graham Hall was clearly more than we bargained for, but at the same time it was an extremely valuable experience for us. First of all, it allowed us to see 15 other teams who function better in a team race environment than we do. We can take a lot of those lessons into our next two team races this season. Also, we were able to get some practice at Navy, which is always a good thing as well. Thanks very much to our graduate advisor Skip Swikart (W’80) who helped us drive the team down as well as coach Billy Martin for sticking with us despite our embarrassing him completely by losing nearly every race. Now the team gets ready for its final regular-season team race, the Admiral Moore at SUNY. The team hopes to sharpen its skills even more in order to be ready for the MAISA Team Race Challenge the following weekend at Kings Point. This weekend, four Penn sailors headed south to kick off the regular spring season at the ODU Spring Open. Jack Swikart, Catie Hopkins, Keen Butcher, and Carolyn Kearney all took the first two days of their spring break to, using a phrase Keen invented, “shake off the cowboys” and get ready for the start of team race season. Coach Billy Martin also accompanied the group down to Norfolk. The forecast for the first morning of racing was so cold that the race committee sent out a notice on Thursday announcing that the start time would be pushed back to 10am to give any remaining ice time to clear out. While we weren’t exactly excited about those temperature predictions, that’s the reason we have drysuits! The breeze the first day was light, and the Penn sailors did well overall in the tricky conditions. Jack and Catie started off well in A Division, with two seconds and a first, but faced some challenges later in the day when the breeze really got shifty. They ended the day two points out of first in A. 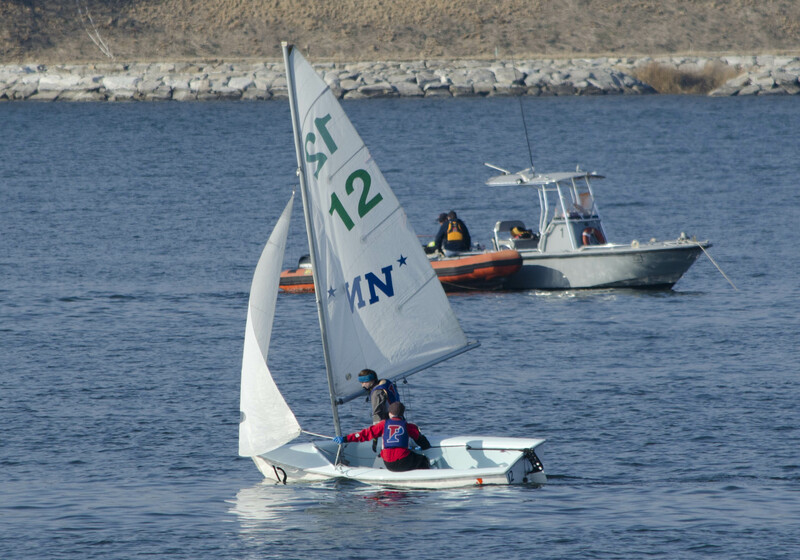 Keen and Carolyn found day 1 to be a great learning experience, this being only the second doublehanded regatta ever for our freshman Laser sailor. While they got off to a rough start, the duo bounded back by winning the third race and scoring top 10s to close out the day. After 6 races the team was in 4th overall, but only three points out of 2nd. Kings Point was very far ahead in first. The second day had steadier breeze, so we knew we would get more races off than Saturday. The temperature also moderated significantly, which was nice – the Saturday cold was brutal. Jack and Catie were back to form on day 2, scoring all firsts and seconds to take first in A division. One hiccup came after race three when another boat accidentally punctured our sail with their mast (it was complicated and would need a drawing to explain), but the Race Committee granted us breakdown redress and had the boat back on the water with a new sail by the next race! In the other division, Keen and Carolyn showed improvement yet again, with no score worse than their average the previous day. With this 3-point-per-race improvement, the freshmen Quakers in B Division moved up to 5th place, boosting the team to second overall and passing St. Mary’s. While the team managed to narrow the gap separating them from first place Kings Point, it was just too much to make up in one day. Congrats to the Mariners on the win! Everyone had fun and learned a lot at ODU – it’s a great event to start off the season. Thanks to the Monarchs for hosting the event and braving the cold. Stay tuned as the Quakers move into team race season in two weeks at the Graham Hall Team Race!